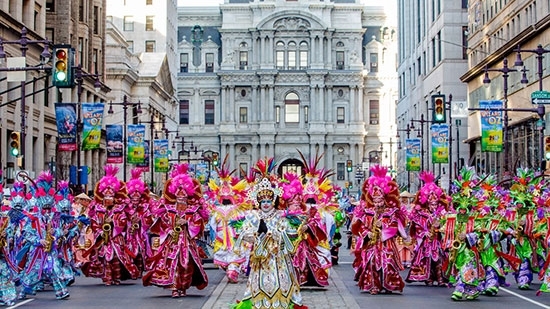 The Philadelphia Mummers Parade 2018 WILL be held on Monday, January 1st, despite the forecast of extreme cold temperatures. Throughout the week officials had been weighing the possibility of postponing the annual New Year's Day tradition. A vote was held on Saturday afternoon between the city and mummer division heads (Fancy, Comic, Wench Brigade, String Band, Fancy Brigade). It was 3-2 in favor of keeping the parade on. The forecast high for Monday is 19 degrees with wind chills in the single digits, but it will be around 13 at the 9 a.m. start. The coldest New Year's Day was in 1918. It was 16 for the high. There will be warming tents along the route for performers. You can always watch the parade from home on TV on PHL17 or stream it online at http://phl17.com/live/. This morning's snow caused havoc on area highways. An almost 20-car pileup shutdown I-76 (Schuylkill Expressway) near Gladwynne. It happened in the westbound lanes just before 8 a.m. The road opened up shortly before noon. Only one person was injured. Another accident involving more than 20 cars happened on the Pennsylvania Turnpike in Chester County. This pileup occurred around 10 a.m. in the eastbound lanes of I-276 approaching Downingtown. Nine people were taken to Paoli Hospital. They were treated and released. On I-476 (Blue Route) northbound in West Conshohocken, a tractor trailer overturned. The front cab of the truck then fell off the side of an overpass. The driver was able to get out of the cab before it fell off and into the vegetation below.